Clothing is a basic need for human beings that provides protection to the body from environmental and climatic hazards. Extreme conditions require characteristic properties that are application-specific rather than just a basic need. High performance is a desirable attribute for professionals and comfort improves activity competence. A garment needs to be satisfactory for activity conditions for it to influence performance. High performance textiles cover a wide range of textiles directed by the breath of activities depending on the end use. These include classes such as personal protective textiles, medical health protective textiles, and sportswear protective textiles. There are various tasks performed in adverse conditions such as firefighting, sports, and others. Executing these tasks in adverse conditions can reduce the ability to perform posing a threat to health and safety in the oversight of important considerations. High performance apparels protects the body in relation to the wearer’s occupation. Several industries such as sports, aerospace, and military use protective clothing for high performance. The key issues in protective textiles are functional performance, clothing comfort, human mobility, and esthetics. However, the design process may trade off an attribute to achieve the most important attribute for the desired function. However, users may be reluctant to accept trading off some attributes. For example, the user may be reluctant to wear a heavy garment that is not esthetically pleasing even though the required function (breathability) is achieved. Functional apparel has become a tool for safety, driven by fabric and apparel design innovations in the market. The major role of protective clothing is to reduce or eliminate health and safety risks caused by fire, chemicals, and the environment. The product has to perform to the expectation of a given task for it to be considered functional. Appropriate protective clothing should eliminate occupational hazards and provide comfort to the wearer. Hazards are more common in the industrial sector where physical activity is high. Examples of protective clothing include combat clothing, high visibility apparel, medical protective clothing, and more. Performance factors are powerful selling tools because high performance is significantly important to consumers. The textile industry is committed to improving high performance for protective clothing particularly in extreme applications such as firefighting, sportswear, and ballistic protection. Protective wear manufacturers have developed new technologies to enhance the functionality of products. They capitalize in emerging technologies such as nanotechnology, wearable technology, and smart textiles to enhance product functionality. Apparel characteristics for durability including abrasion resistance, tensile strength, and tear strength are mandatory for everyday products but high performance apparel requires additional functional properties that are application specific. Comfort means absolute freedom from pain or discomfort, which gives a nutritional sensation to the body. Discomfort is the wearer’s consciousness of the garment with an unpleasant experience. Comfort influences the overall performance of the wearer during an activity; hence, comfort has attracted the interest of researchers. It is an essential attribute for high performance because it affects both the well-being of the wearer and efficiency in executing the task. High performance, on the other hand, is influenced by extrinsic and intrinsic attributes as indicated in the above figure. Therefore, determining attributes for a given scenario is vital for designing an appropriate garment. Favorable conditions reduce hazards, accidents, and promote productivity. Clothing comfort is a result of the evaluation of the user’s perspective, environment, and clothing attributes. A comfortable worker is more focused and productive. The human environment has to be comfortable for efficient high performance. Thermo-physiological comfort is the ability of the body to regulate the thermal environment and coordinate the production and loss of body heat. The comfort relates to the sensational discomfort the wearer feels when part or the entire garment touches the skin. These include tactile, thermal, and moisture sensations. When the skin comes into contact with the fabric, the body feels tactile sensations such as smooth, prickly, and soft. Thermal sensations experienced by the body during wear are warmth, coolness, and hotness. Moisture sensations are wet, clammy, and sticky. Fibers, yarns, and fabric finish influence the effect of sensorial comfort. Psychological comfort is related to self-consciousness and satisfaction of available choices. This comfort is characterized by emotional attributes. 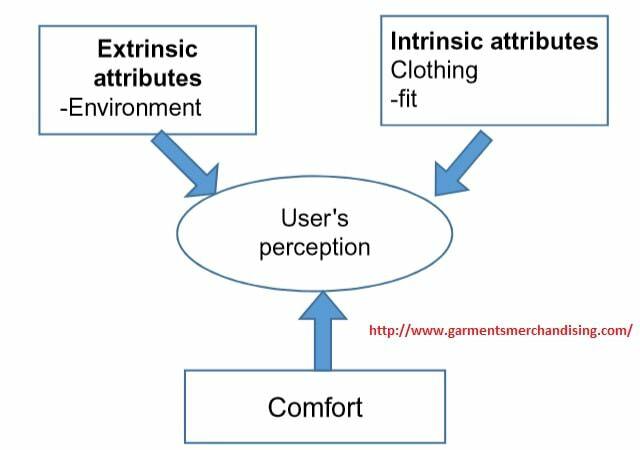 The users are the best people to evaluate psychological comfort during repeated assessments of clothing. Movement is critical for functional activity and performance. Therefore, clothing designs have to incorporate mobility features. The anatomy of the wearer and the task to perform are crucial for the safety and comfort of the wearer. Movements such as flexion, extension, and abduction are important in product development for high performance garments. Flexible garments are safe and they reduce entrapment hazard. Fabric thickness and the design system affect mobility. The weight of the garment and increased layers of the clothing system reduce mobility. It is important to use high performance fabrics to achieve wearer comfort and flexible movements. Ease and the shape of pattern pieces affect garment fit at different body areas. Garment design that takes into consideration ease and contour of the garment and how they affect the garment at different areas contributes to an effective design. Moisture management is the controlled movement of liquid (perspiration) from the skin surface to the environment through the fabric. It is an important factor in optimizing comfort and maximizing performance. Transfer of perspiration from the skin to the atmosphere regulates the body temperature and maintains heat balance, thus controlling the comfort level of environmental conditions and activity. Clothing plays an important role in eliminating extra heat produced to keep the body at a core temperature of 37°C. 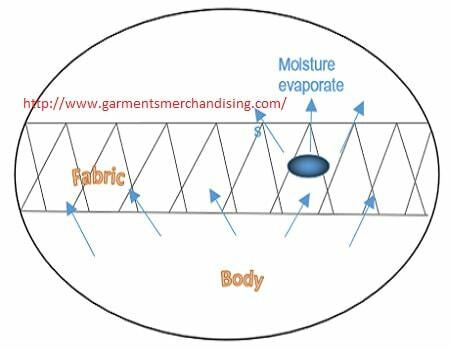 The role of moisture-management fabrics is to regulate heat and moisture to maintain the body temperature and keep the body cool as illustrated in the above figure. Wetting and wicking take place before perspiration evaporates from the skin through the fabric into the atmosphere. Fibers preferred for moisture management include polyester for its low moisture absorption, polypropylene for its excellent moisture wicking, and polyamide for wicking and durability properties. Transferring moisture from the skin to the environment through clothing is influenced by fabric weight, fiber fineness, fabric construction, and garment design. 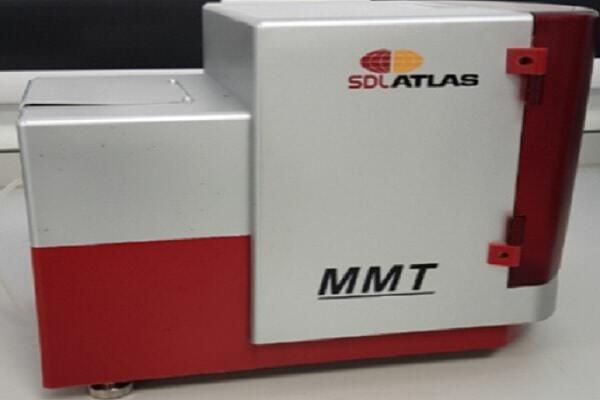 Moisture management is evaluated using a moisture management mester (MMT). Category: Special Clothing Tags: Comfort clothing brand, High-performance apparel materials, What is apparel comfort?, What is high performance clothing?, What is moisture management in clothing?